A lot of ultra-portable stoves and camping kit simply doesn’t cut it. It’s flimsy and weak, you can’t do a single thing with it. Not our picks. At Camping Things we’re proud of our selections and only review the most high-quality equipment around, at the best prices. These ultra portable stoves are light, powerful and built to last. If you’re in the market for a portable alcohol burning stove, the Lixada isn’t only one of the best, most affordable options, it’s also one of the most attractive. The elegant stacking design keeps everything sturdy and compact. These portable stoves runs on alcohol fuel, and if you don’t use it all at once, simply cover with the included screw-top sealing cover. Durable, attractive, super packable and available in four different colours, for the fashion-forward camping chef. With a packed weight of 188g, the Lixada weighs next to nothing, and the elegant stacked design, which is also incredibly durable and hard-wearing, makes it easy to pack and transport. Fits easily into a backpack or glove compartment. The Lixada is made from a combination of copper and aluminium alloys, making it lightweight in all the right places, and durable and conductive in others. The Lixada is really simply constructed, with four main components — a stent (stand), fuel reservoir, sealing cover and fire cover. No switches on the Lixada, when you’re done cooking, simply replace the extinguishing lid and the fire will die out. Choice of four stand colours: bronze, gold, green and grey. Stackable design makes the Lixada really easy to use, set up and carry around. It’s also one of the most attractive portable stoves we’ve seen. The BushBox is a customisable, beautiful piece of engineering. Also known as a hobo stove or firebox, the BushBox is designed to fold away to under 1 cm in thickness. 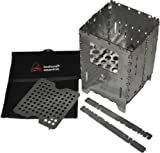 It assembles with strong, non-stick hinges, and can house either a fuel burner, or other natural fuel sources such as leaves and wood. Space for pans on the top, with the option of a grill plate for cooking meat BBQ style, the BushBox isn’t the cheapest, but it sure is one of the most fun. The BushBox weighs in at just over 800g, so it’s not the lightest, but it’s made from solid materials, which mean your food is in safe hands on top of it. For its size it is ultra portable, folding down to thinner than 1 cm, inside its own special carrying case. Measures 12 x 19 cm. The BushBox is made from 100% stainless steel, so it;s about as hardy as they come. It comes in a durable carry case, too, so you can slot it into your backpack. The holed grill plate is so, so good for cooking food directly over the fire. Simply slot it into place and away you go. Comes with supports to rest frying pans on, and because the BushBox houses whatever fuel you’ve got, it’s also great for providing general heat during cold weather camping. Cooking food on the grill plate directly over the fire is awesome, and the way the BushBox packs down so thinly makes it super portable. For those looking for a classic, reliable, petrol-burning camping stove, the Coleman is about as classic and reliable as they come. Runs on unleaded petrol, or, if you prefer, Coleman’s own liquid burner fuel. Sturdy and totally outdoor-ready, these Coleman portable stoves are a solid investment for a lifetime of camping and hiking. With a runtime of over eight hours, you might even try your hand at some al fresco slow cooking. Made to last, the Coleman is constructed using steel and aluminum alloys. Comes in a hard plastic carry case, the Coleman Sportster is going to be with you for years. Works with a simple plunger valve operation system, the Sportster is unfussy, but extremely well made. Built to last and to heat food and water fast, we love this little stove, as it punches way above its weight. The Sportster lives to be out in the field. It burns long and strong and is a solid investment that’ll last for years. Great value for money. Even the slightest breeze can blow out lesser stoves before they even really get going. The Lixada is windproof around its entire edge, making it frustration-proof, too. Attaches separately to a gas canister via a flexible hose, and folds up neatly for transportation. It’s bare bones, but it works well and we love it. The Lixada does fold up to make it more portable, although it doesn’t flatten like the BushBox does. It’s solid and extremely well made, and at 280 g, it’s capable of holding up 10 kg of weight. Not that you’d load it with that much, it just means that it’s incredibly sturdy. As with all Lixada products, this one comes in a handy box for storage and transportation. Made from stainless steel and copper, runs on butane gas. The Lixada features a cellular furnace chamber at the top, which helps to release a large amount of heat, evenly, so that you food cooks properly all around. Features three stents (stands), which fold in and out, and they’re really well and sturdy. The Lixada has a fairly wide base, which is fine once it’s out in the open, and means it provides a solid foundation for pans. The cellular furnace diffuses the heat evenly but strongly, so that food and liquids heat evenly but efficiently. A great contender to top this portable stoves review. No harsh chemical emissions, no gas canisters, the Fofar is essentially a housing for whatever natural fuels you have at hand. Wood, leaves and twigs make great kindling, and the Forfar provides a place to burn them, and a stand to hold your cookware. Like the Lixada, the Forfar is stackable, so it’s compact, portable and lightweight. Awesome for the eco-conscious camper. As we’ve mentioned, the Forfar is stackable, and made from thin, strong and lightweight hardened stainless steel, so it’s strong and packable. Weighs in at under 350 g, so it won’t be any hassle at all to carry around. The Forfar is made from rust-proof, durable stainless steel. The Forfar is made to help you burn what’s available to you, be it wood, twigs, leaves or paper. Simply stack the Forfar together as instructed, add your fuel and burn. Simple construction, can also be used as a safe, mini outdoor heater. No need for gas canisters or artificial fuels, you can use what’s around you with the Forfar. Just wanted to comment on the Bushbox, give it a try it’s a lot of fun and really does work – although we did have a gas stove packed as a backup. Used the Coleman Sportster Portable Stove for a few treks and love the fact you can literally burn any fuel.